November 2017 | TOMMY JOHNSON, Jr.
POMONA, Calif. (Nov. 12, 2017) – Tommy Johnson Jr. with Terry and Doug Chandler’s Make-A-Wish team couldn’t have picked a better time to defend the title they won a year ago in the NHRA Finals at Pomona, Calif.
“Our entire team has had a lot of family deaths this year, three guys on my team lost a family member and it’s just been a rough year for us but we kept fighting,” Johnson said. The team’s only other Wally Trophy was won at Las Vegas in April but their mentor and friend, the late Terry Chandler, wasn’t able to attend that race. The following week, she was diagnosed with brain cancer and lost her valiant battle on July 4. The last time she joined her team in a winner’s circle was a year ago at Pomona, and Sunday was the team’s first win since her passing. “We’ve tried several times to win another one for her, and I knew this was our last time this year,” said Johnson, who raced in the final round of the season three straight years. Johnson defeated Robert Hight in the final round after Hight won the world championship earlier in the day. Johnson and the Make-A-Wish team might not have been able to finish the season had her husband, Doug, not decided to continue funding the team to finish this season and committed to funding both the Make-A-Wish and Infinite Hero teams for at least three years. The Make-A-Wish team will finish the season in sixth place after being the championship runner-up last year and third the two previous years. POMONA, Calif. (Nov. 12, 2017) – Tommy Johnson Jr. with Terry and Doug Chandler’s Make-A-Wish team defending its title at the NHRA Finals was the only accomplishment that could have salvaged an otherwise disappointing race day for Don Schumacher Racing. Johnson and the team led by crew chief John Collins and assistant Rip Reynolds defeated new Mello Yello world champion Robert Hight in the final round at Pomona. The last time she joined her team in a winner’s circle was a year ago, and Sunday was the team’s first win since her passing. While DSR continues to feel the loss of its biggest fan, Collins’ tuning and Johnson’s driving certainly softened the blow. The first disappointment came Saturday when DSR’s Antron Brown and the Matco Tools team watched their two-year run as world champions end. And on Sunday, reigning world champion Ron Capps and the NAPA AUTO PARTS Dodge Charger R/T started the day trailing Robert Hight of John Force Racing by eight points but Capps’ goal of being the first Funny Car driver to repeat as champion since 2001 was thwarted when he lost traction in the opening round. He had to win one round more than Hight to repeat. In the opening round, Capps was paired against longtime friend Del Worsham but Capps’ Dodge went into tire smoke and despite a near perfect effort at regaining traction was enough for his 4.177-second run at 316.52 mph to catch Worsham’s subpar run (4.045 at 306.19) to the finish line. “It rattled and I gave it a pedal,” said Capps, who is runner-up for the championship fifth time. “I saw Del out there. I love racing him, I get up to race him. Capps had a remarkable season by winning six of 18 events in the Mello Yello regular season and two of six in the Countdown to the Championship playoff. Ironically, Steve Torrence dominated the season with eight event titles but his championship hopes were dashed when two-time reigning world champion Antron Brown in DSR’s Matco Tools dragster beat Torrence in the second round in one of the day’s best races. Brown’s 3.691 at 328.30 edged Torrence’s 3.695 at 328.46. “Stevie and I are best friends but he knows we all have to race to win,” said Brown, who lost in the semifinals to new world champion Brittany Force. Despite winning 25 Mello Yello titles this year, it marks the first time DSR has not won a world championship in the past four years and only the third time in the past seven seasons when it did not have a champion crowned. POMONA, Calif. — For the first time since 1982, a female has captured a NHRA Mello Yello Drag Racing Series Top Fuel world championship. Brittany Force clinched the category crown in the quarterfinals of eliminations Sunday at the Auto Club NHRA Finals at Auto Club Raceway at Pomona. Robert Hight (Funny Car) and Bo Butner (Pro Stock) also won world championships in their respective categories at the final 2017 NHRA Mello Yello Drag Racing Series event. The race winners at Auto Club Raceway at Pomona were Force (Top Fuel), Tommy Johnson Jr. (Funny Car), Butner (Pro Stock) and Andrew Hines (Pro Stock Motorcycle). Force, daughter of 16-time Funny Car world champion John Force, became just the second female to win a Top Fuel world championship by piloting her Monster Energy dragster to a 3.679-second pass at 328.22 mph defeating Richie Crampton and his 3.757 pass at 323.81 in the quarterfinals. The other female to win a championship in the category was legendary racer Shirley Muldowney. Steve Torrence, who entered the race as the Top Fuel points leader, fell to 2016 world champion Antron Brown’s 3.691 pass at 323.81 to guarantee the title crown to Force. Force, who was also the No. 1 qualifier, raced to victory at the season ending event by defeating Shawn Langdon with a 3.668 pass at 330.07 when he smoked the tires in the final round. She finishes the season with four race wins, the first coming at the New England Nationals in Epping, N.H. Force went on to win three events in the NHRA Mello Yello Drag Racing Series Countdown to the Championship, the Dodge NHRA Nationals in Reading, Pa., the AAA Texas NHRA FallNationals and this weekend’s season ending event. She has two runner-up finishes and two No. 1 qualifiers. Hight secured his second NHRA Mello Yello Drag Racing Series Funny Car world championship in the first round of eliminations Sunday. Hight powered his Auto Club of Southern California Chevrolet Camaro SS Funny Car to a 3.839-second pass at 332.51 mph to defeat Tim Wilkerson who smoked the tires at the starting line. Ron Capps, who was Hight’s nearest championship contender, smoked the tires and lost to Del Worsham ensuring Hight the world title. Hight’s championship season had four race victories including two wins in the famed Western Swing and two victories during the NHRA Mello Yello Drag Racing Series Countdown to the Championship. He earned eight No. 1 qualifiers and had two runner-up finishes. At the event in Brainerd, Minn. Hight set the Funny Car national elapsed-time record with a 3.793 pass and in Sonoma, Calif. Hight went on to set the national speed record with a pass at 339.87. Hight closed out his 2017 season with a runner-up finish falling to Tommy Johnson Jr. in the final round. Butner claimed his first NHRA Mello Yello Drag Racing Series Pro Stock world championship by winning the event. Butner drove his Jim Butner’s Auto Chevrolet Camaro to a 6.594 pass at 210.70 mph to defeat Tanner Gray’s 6.653 run at 208.62 in the final round of the Auto Club NHRA Finals. Butner earned his first career victory at the NHRA SpringNationals in Houston earlier this year and ends the season with five event wins and six runner-up finishes. Butner took fate into his own hands when he defeated teammate Greg Anderson in the semifinals with a 6.551 pass at 210.05. Had Butner lost in the finals, Anderson would have won the world championship. In Funny Car, Johnson Jr. raced to a 3.920 pass at 329.10 in his Make-A-Wish Dodge Charger R/T while Hight had trouble off the starting line. It was Jonson Jr.’s second win of the season, 17th of his career and second consecutive at Auto Club Raceway at Pomona. Johnson Jr.’s path to victory included wins against Bob Bode, the retiring Alexis DeJoria and teammate and No. 1 qualifier Jack Beckman. Hight took out Tim Wilkerson, Matt Hagan and teammate Courtney Force and won the world championship before falling to Johnson Jr. in the finals. Hines won the Pro Stock Motorcycle portion of the race to continue his streak of 14 consecutive seasons with at least one victory. He defeated teammate and newly crowned 2017 NHRA Mello Yello Drag Racing Series Pro Stock Motorcycle world champion Eddie Krawiec with a 6.856 pass at 196.02 on his Screamin’ Eagle Vance & Hines Harley Davidson. Krawiec rode to a 6.930 run at 177.58. POMONA, Calif. — Final finish order (1-16) at the 53rd annual Auto Club NHRA Finals at Auto Club Raceway at Pomona. The race is the final of 24 events in the NHRA Mello Yello Drag Racing Series. 1. Brittany Force; 2. Shawn Langdon; 3. Antron Brown; 4. Doug Kalitta; 5. Steve Torrence; 6. Clay Millican; 7. Leah Pritchett; 8. Richie Crampton; 9. Tony Schumacher; 10. Terry McMillen; 11. Wayne Newby; 12. Mike Salinas; 13. Troy Buff; 14. Scott Palmer; 15. Terry Haddock; 16. Shawn Reed. 1. Tommy Johnson Jr.; 2. Robert Hight; 3. Jack Beckman; 4. Courtney Force; 5. Matt Hagan; 6. John Force; 7. Alexis DeJoria; 8. Del Worsham; 9. Ron Capps; 10. J.R. Todd; 11. Tim Wilkerson; 12. Jeff Arend; 13. Jeff Diehl; 14. Bob Bode; 15. Jim Campbell; 16. Gary Densham. 1. Bo Butner; 2. Tanner Gray; 3. Jason Line; 4. Greg Anderson; 5. Drew Skillman; 6. Jeg Coughlin; 7. Erica Enders; 8. Brian Self; 9. Chris McGaha; 10. Alex Laughlin; 11. Matt Hartford; 12. Alan Prusiensky; 13. Shane Gray; 14. Allen Johnson; 15. Deric Kramer; 16. Kenny Delco. 1. Andrew Hines; 2. Eddie Krawiec; 3. Matt Smith; 4. LE Tonglet; 5. Scotty Pollacheck; 6. Chip Ellis; 7. Jerry Savoie; 8. Joey Gladstone; 9. Angie Smith; 10. Steve Johnson; 11. Katie Sullivan; 12. Ryan Oehler; 13. Lance Bonham; 14. Freddie Camarena; 15. Karen Stoffer; 16. Hector Arana Jr.
Top Fuel — Brittany Force, 3.668 seconds, 330.07 mph def. Shawn Langdon, 9.818 seconds, 89.10 mph. Funny Car — Tommy Johnson Jr., Dodge Charger, 3.920, 329.10 def. Robert Hight, Chevy Camaro, 6.827, 103.71. Pro Stock — Bo Butner, Chevy Camaro, 6.554, 210.70 def. Tanner Gray, Camaro, 6.653, 208.62. Pro Stock Motorcycle — Andrew Hines, Harley-Davidson, 6.856, 196.02 def. Eddie Krawiec, Harley-Davidson, 6.930, 177.58. Top Alcohol Dragster — Shawn Cowie, 5.272, 274.72 def. Julie Nataas, 5.481, 272.50. Top Alcohol Funny Car — John Lombardo Jr., Chevy Camaro, 5.420, 271.41 def. Annie Whiteley, Camaro, 5.417, 273.22. Competition Eliminator — Dan Fletcher, Chevy Cobalt, 8.022, 168.11 def. Tom Mettler, Dodge Dakota, 7.399, 183.34. Super Stock — Robert Cruzen, Chevy Cobalt, 9.344, 142.81 def. Jimmy DeFrank, Cobalt, 8.825, 151.70. Stock Eliminator — Austin Williams, Plymouth Duster, 11.080, 109.61 def. Chris Stephenson, Pontiac Firebird, 10.620, 122.56. Super Comp — Bobby Dye Jr., Dragster, 8.904, 167.51 def. Tanner Theobald, Dragster, 8.884, 167.45. Super Gas — Steve Parsons, Chevy Chevy Corvette, 9.895, 171.62 def. Mike Wiblishouser, Corvette, Foul – Red Light. Summit Super Pro — Todd Martin, Undercover, 7.610, 174.89 def. Dale Green, American, 8.886, 173.99. Summit Pro — Jason Patterson, Chevy Camaro, 9.598, 135.82 def. Butch Weinreich, Dodge Dart, 11.018, 120.84. Summit Sportsman — Troy Johnston, Plymouth Duster, 12.005, 111.00 def. Jake Howard, Chevy S-10, 11.974, 108.98. Summit Pro Bike — Riley Toth, Kawasaki, 8.605, 144.09 def. Curt Spraklin, Kawasaki, 8.614, 145.88. FINAL — Force, 3.668, 330.07 def. Langdon, 9.818, 89.10. FINAL — Johnson Jr., 3.920, 329.10 def. Hight, 6.827, 103.71. FINAL — Butner, 6.554, 210.70 def. T. Gray, 6.653, 208.62. 1. Brittany Force, 2,690; 2. Steve Torrence, 2,609; 3. Doug Kalitta, 2,553; 4. Antron Brown, 2,508; 5. Leah Pritchett, 2,452; 6. Clay Millican, 2,419; 7. Shawn Langdon, 2,406; 8. Tony Schumacher, 2,395; 9. Terry McMillen, 2,310; 10. Scott Palmer, 2,218. 1. Robert Hight, 2,686; 2. Ron Capps, 2,588; 3. Courtney Force, 2,543; 4. Jack Beckman, 2,519; 5. Matt Hagan, 2,470; 6. Tommy Johnson Jr., 2,452; 7. John Force, 2,388; 8. Tim Wilkerson, 2,296; 9. J.R. Todd, 2,282; 10. Cruz Pedregon, 2,178. 1. Bo Butner, 2,731; 2. Greg Anderson, 2,724; 3. Jason Line, 2,644; 4. Tanner Gray, 2,558; 5. Drew Skillman, 2,476; 6. Erica Enders, 2,367; 7. Jeg Coughlin, 2,318; 8. Allen Johnson, 2,284; 9. Chris McGaha, 2,257; 10. Vincent Nobile, 2,052. 1. Eddie Krawiec, 2,783; 2. Andrew Hines, 2,614; 3. LE Tonglet, 2,591; 4. Scotty Pollacheck, 2,492; 5. Jerry Savoie, 2,472; 6. Matt Smith, 2,454; 7. Hector Arana Jr, 2,453; 8. Karen Stoffer, 2,301; 9. Joey Gladstone, 2,280; 10. Angie Smith, 2,258. BROWNSBURG, Ind. 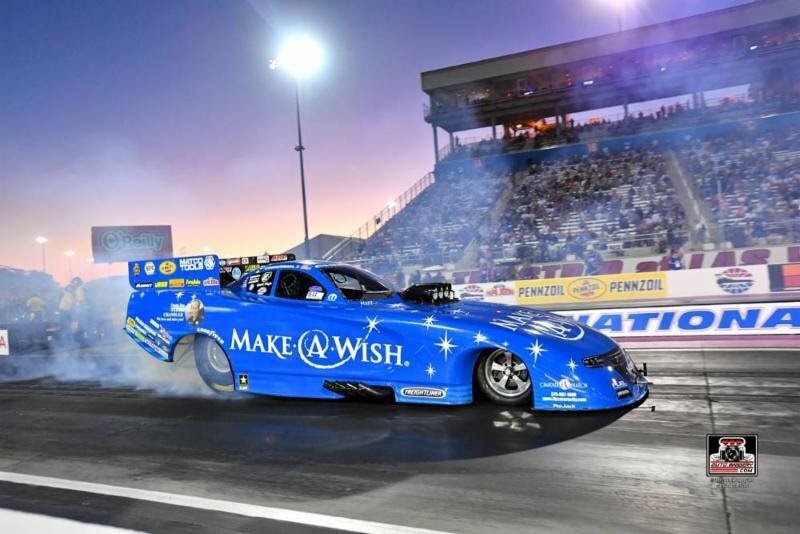 (Nov. 8, 2017) – As the 2017 season closes, Terry and Doug Chandler’s Make-A-Wish Funny Car team have begun preparing for the next season. “We stayed to test after the Las Vegas race and worked with a six-disc clutch set-up that showed a ton of potential,” said Don Schumacher Racing Funny Car pilot Tommy Johnson Jr.
Johnson and the team led by crew chief John Collins and assistant Rip Reynolds are ready for this weekend’s season-finale at Pomona, Calif., knowing they have been mathematically eliminated from championship contention heading to the last of 24 NHRA Mello Yello Drag Racing Series events.